What are the requirements for a degree in ECE? Electrical and Computer Engineering Department concentrates on classical engineering training in these fields of engineering. 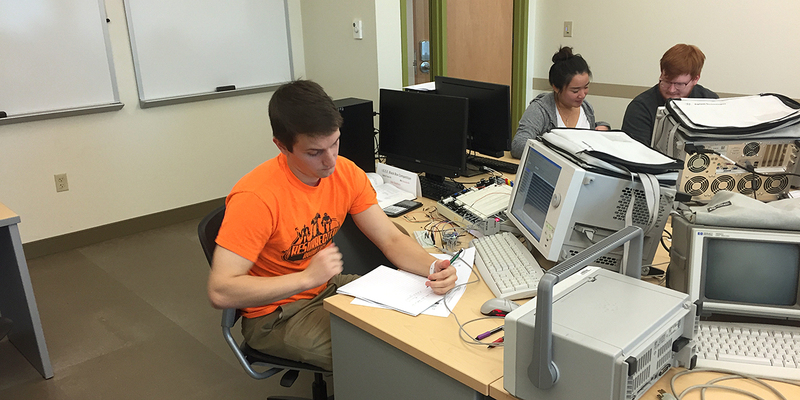 Students are exposed to a balanced selection of courses spanning circuit analysis and design, analog and digital signal analysis, computer architecture, theory and practice in various specialties. The fundamentals and analytical skills are later expanded in the graduate program to provide students with a more focused design and research-oriented study. To see a listing of required courses visit the Academic Profiles. DC and AC steady-state circuit analysis. Loop and nodal analysis, network theorems, phasors, complex power, single-phase and three-phase circuits. Prerequisites: PHYS 151, PHYS 151L, MATH 150, MATH 152, MATH250 or concurrent enrollment in MATH 250. Time-domain transient analysis, complex frequency, frequency response, two-port networks, Laplace Transform techniques, impulse response and convolution. Three hours lecture and one 3-hour laboratory per week. Concepts and design of digital and computer circuitry; binary number systems; study of microprocessors and assembly language programming. Laboratory exercises involve circuit implementation and programming. Three lecture hours and one 3-hour lab per week. Prerequisites: CS140 or CS145 or consent of instructor. Introduction to semiconductors; diode, transistor and FET; small and large signal analysis; logic gate families and design. Three hours lecture and one 3-hour laboratory per week. Prerequisites: 211 (or equivalent) with minimum grade of C.
Introduction to engineering electromagnetics. Includes vector analysis, time-harmonic fields, electromagnetic wave propagation, transmission lines, waveguides, antennas. Prerequisites: PHYS 211b, PHYS 212b, ECE 211. Basics of continuous and discrete signals and systems. Convoluton, Fourier analysis, filtering, modulation and sampling, Z-transforms. Prerequisites: 211 (or equivalent) with grade of C or better. Feedback control systems analysis and applications. Signal flow graphs, state variable approach, modeling, root-locus, Bode plots and steady state errors, Nyquist plots. Prerequisite: ECE 351.